Third-party violations of anti-bribery and corruption (ABC) laws are top of the list of perceived risks for compliance professionals in 2018, according to a new report by Kroll and the Ethisphere Institute. 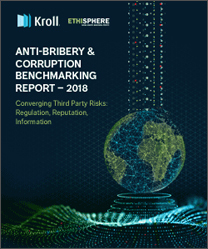 The ‘2018 Anti-Bribery and Corruption Benchmarking’ report reveals compliance teams are having to deal with the convergence of regulatory mandates, critical reputational factors and data security issues as they try to protect their organisations from substantial financial and reputational harm, as well as regulatory and legal exposure. Furthermore, 93 percent of 448 study respondents said ABC risks will remain the same or worsen in 2018. Those who expect a greater level of ABC risks attribute the rise to increased enforcement of existing regulations, followed closely by new regulations. Reputational and integrity concerns remain the number-one reason why a third-party fails to meet an organisation’s standards, with organisations stating they were “concerned” or “very concerned” with beneficial ownership risks associated with their third parties. On a positive note, 36 percent of respondents indicated that their organisation dedicated more resources to ABC issues in 2017 than in 2016. Executive leadership support also remains strong, as 92 percent of all survey respondents said that their leadership team is “highly engaged” or “somewhat engaged” in their ABC efforts.